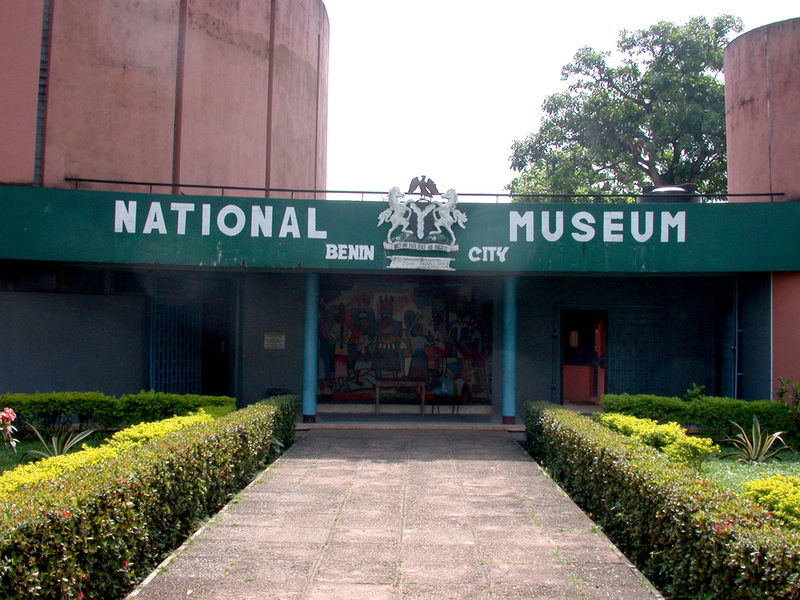 Benin City's National Museum was, in 1944, the second museum to be established in the country, under the auspices of Oba Akenzua II. He first hosted a collection of antiquities in the palace, some of which had been uncovered during 20th-century royal construction. This included a large brass snake's head of the type that had formerly hung on the palace towers, as well as several hip pendants, a figure, and large shield-shaped plaques whose thinness, style, and metallic content suggested an early date. 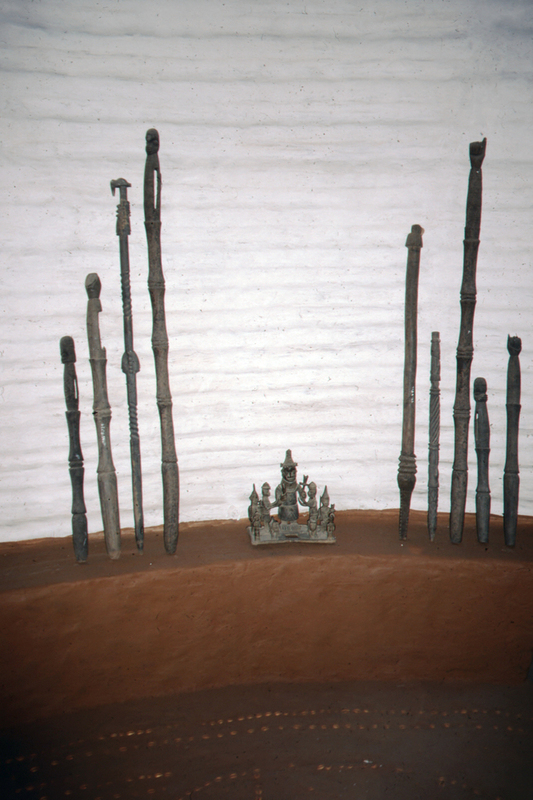 This initial collection developed into Benin's National Museum, with local historian Chief Jacob Egharevba serving as its first curator. It moved to the colonial tax office on Ring Road, then back to the Divisional Council within palace grounds, then into the colonial post office. In 1960, it was handed over to the government. The impetus for museum foundation and the establishment of a federal Department of Antiquities came from a British colonial education officer, Kenneth C. Murray. In the early 1970s, when oil revenue fueled infrastructures, Gov. S. O. Ogbemudia funded the construction of a new dedicated building on King's Square, the centrally-located circle surrounded by the city's Ring Road. This land had been part of the palace complex before the 1987 British invasion, but in 1973 it was opened to the public as a cultural display site. Its rounded Brutalist exterior echoes the circular parcel of land where the museum stands. Antithetical to the traditional rectangular courtyard architecture of the ancient kingdom, it does, however, mimic those structures' reddish earth color, albeit through cement. 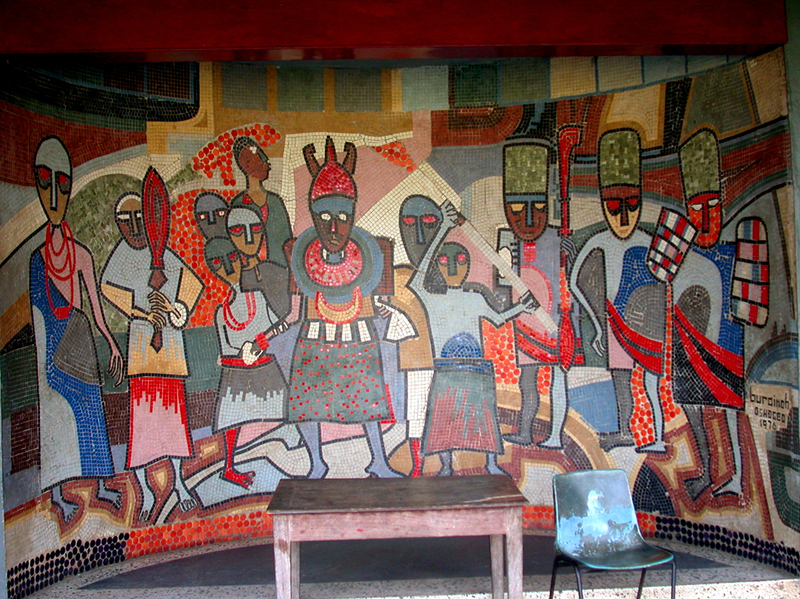 A 1976 exterior mosaic by Yoruba artist Jimoh Buraimoh depicts a lively abstracted court scene of an Oba (presumably Oba Akenzua, as he wears circular spectacles) surrounded by chiefs, courtiers, and shield-bearing figures drawn from 16th-century plaques. 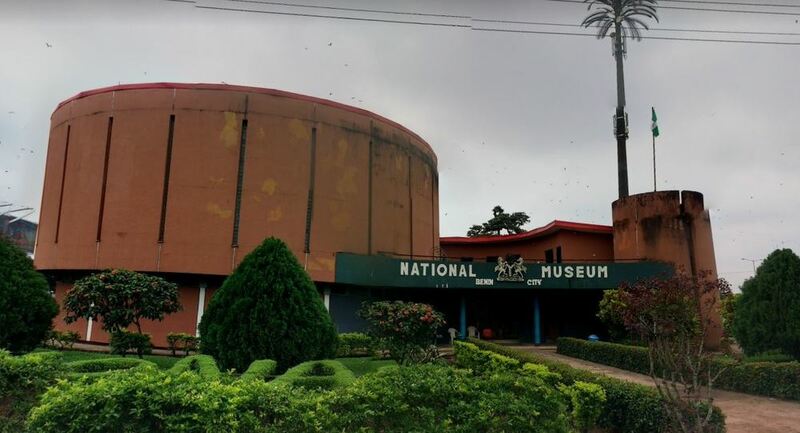 The building's three floors consisted of displays that remained consistent for decades, with the exception of a 1982 special exhibition of repurchased Benin arts. The first (ground) floor was dedicated to mostly pre-1897 antiquities, some of which had been purchased back from Britain when Nigeria was still a colony. This area included exhibits of partially-reconstructed royal altars, albeit with objects clearly separated from one another for display purposes. 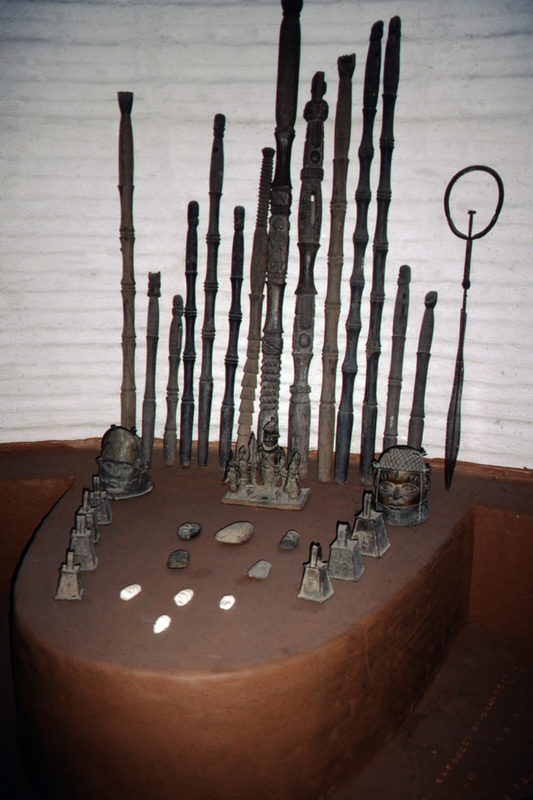 The second floor included some Benin City objects of more recent manufacture, including divination equipment, as well as pottery, masks, and other artworks from elsewhere in the former Bendel State (now divided into Edo and Delta States). The third floor included wooden sculpture, masks, and additional art from other regions of Nigeria. In late September 2017, however, the Smithsonian's National Museum of African Art brought their exhibition “Chief S.O. Alonge: Photographer to the Royal Court of Benin, Nigeria” to the museum as part of its permanent installation. 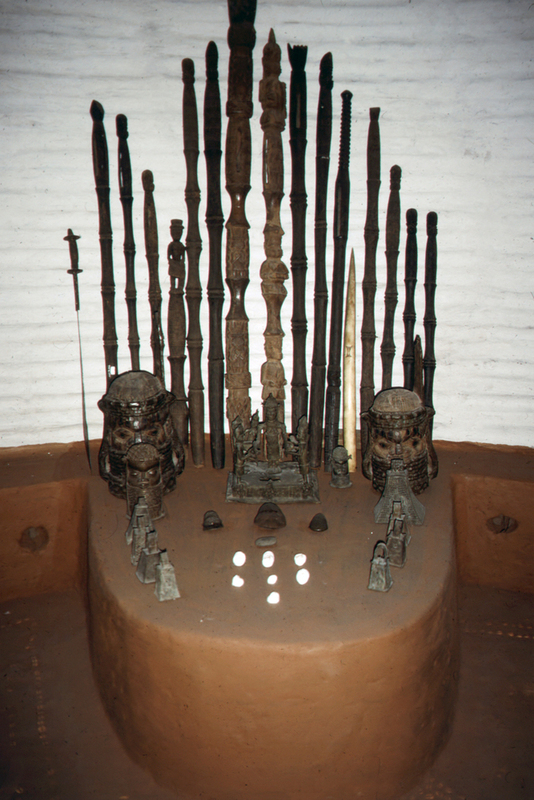 Although limited archaeology has been conducted in Benin City, in 1961-62 Graham Connah investigated the area earmarked for the new museum's construction. While the area was likely the site of the large open gathering place just in front of palace structures, over twenty sections of pre-14th century potsherd pavement were found in a pit. This type of terracotta paving was atypical of Benin City, but is known to have been a feature of the Yoruba city of Ife to the northwest; Benin's present dynasty is said to have originated from Ife. Other cuttings yielded pottery remains and a trussed skeleton, suggesting human sacrifice and/or execution, the former practiced at the palace in past centuries during ceremonies or times of crisis. When the British established their colonial government in Benin City, they cut roads through the former palace grounds and cleared buildings. The area where the museum now stands became their Public Works Department, site of urban planning. The British introduced "burnt bricks," as opposed to sun-dried bricks, as a civic building material, using metal molds to form the local clay and emboss it with the imperial crown. Both manufacturing and kiln-firing of the bricks was done along the banks of the Ikpoba River. Benin Museum with landscaping: The National Museum, Benin City has some of the most creative landscaping in town. It not only includes shrubs trimmed to form words, it incorporates a large fountain with several water features. ~ Creator: Obatarhe Otughwor, photographer; Kathy Curnow, text ~ Date: 2017? 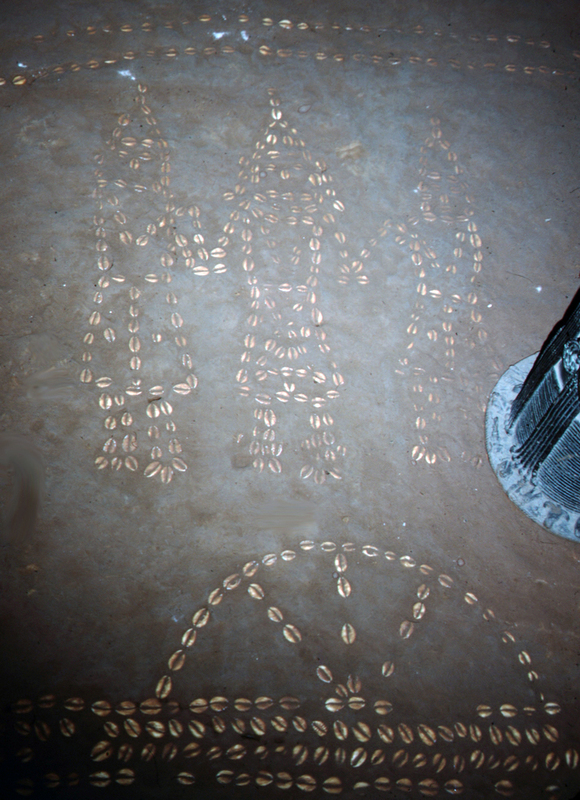 Kathy Curnow, “Benin Museum,” Bright Continent, accessed April 20, 2019, https://access.thebrightcontinent.org/items/show/6. Egharevba, Jacob U. Descriptive Catalogue of Benin Museum. Benin City, Nigeria: 1969. Willett, Frank. "The Benin Museum Collection." African Arts 6 (4, 1973): 8-17; 94. Kaplan, Flora Edouwaye S. ""Nigerian Museums: Envisioning Culture as National Identity." In Flora E. S. Kaplan, ed. Museums and the Making of "Ourselves," pp. 45-78. New York: Leicester University Press, 1994. Nkanta, Michael A. and Emmanuel Nnakenyi Arinze. The Lost Treasures of Ancient Benin. 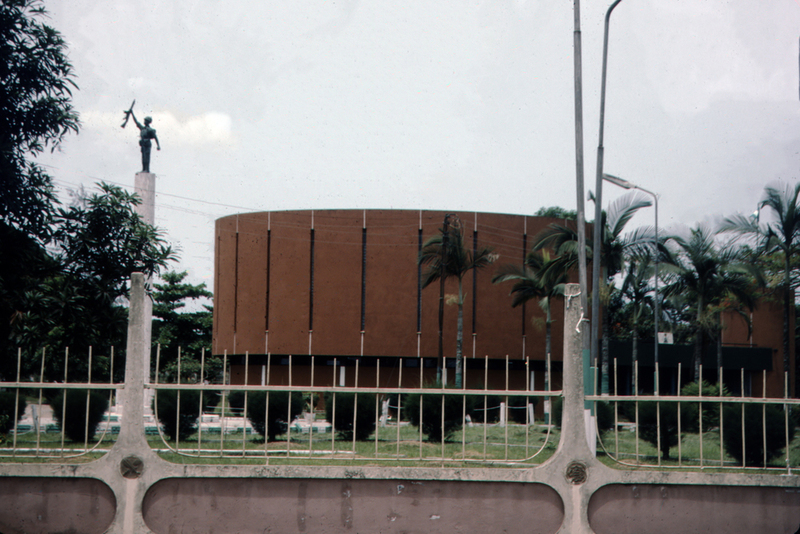 Benin City, Nigeria: National Museum, Benin City, 1981. Kennedy, Jean. New Currents, Ancient Rivers: Contemporary African Artists in a Generation of Change. Washington, DC: Smithsonian Press, 1992. Published on Aug 5, 2017. Last updated on Nov 10, 2017.